At Charlottesville Aquatics we build all our swimming pools with the most advance automation technology OmniLogic. 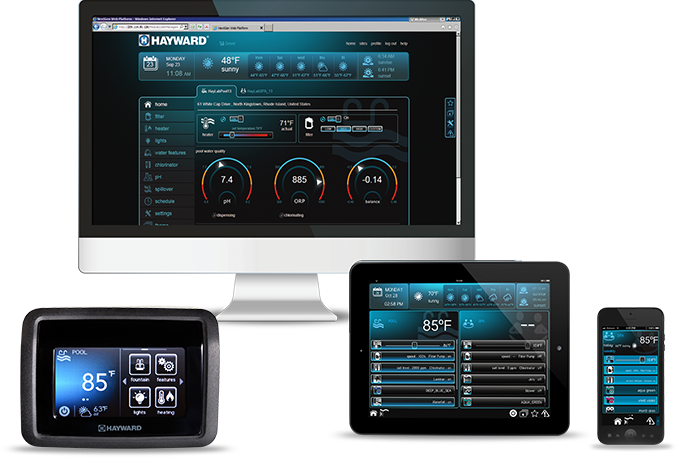 With OmniLogic “Total Backyard Control” is now right at your fingertips. OmniLogic lets you control nearly every aspect of your backyard from anywhere. Its icon-based touchscreen interface is unmatched in the industry, and with apps for iPhone®, iPad®, and Android™, everything from turning up the heat on your spa to setting the theme for your next backyard party can be achieved with a single touch. OmniLogic’s modular system architecture offers the flexibility and scalability needed as your backyard evolves through the years. Want to add a heater? A porch fan? Landscape Lighting? Now you can seamlessly and painlessly add devices with easy plug-and-play expansion. Stay on the cutting edge of automation technology with OmniLogic’s unique USB feature, which allows you to upload new capabilities or install and restore configurations—no more costly, time-consuming upgrades necessary. Customize OmniLogic to fit your family’s unique personality. Set up to 50 Favorites icons to access the features and functions you use most, quickly and easily. Build up to 25 customizable themes to create the atmosphere for a romantic evening or a lively pool party, all with the touch of a button.